NEW Store - Opening TOMORROW! Sophisticated. Delicious. Beautiful. 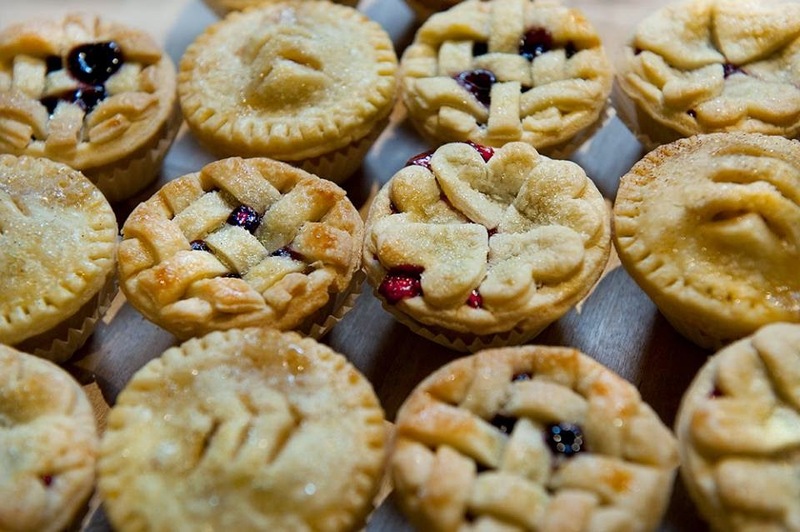 Homebaked Kitchen Co. Yesterday was a day I will remember always. Before the doors opened, both Jen and I were running around making sure all of the finishing touches were in place. Everything came together just in time! We even had a few people waiting for our doors to open. That made me smile. 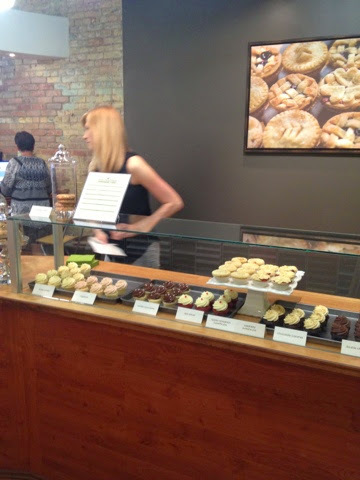 Jen's baking looks amazing on our beautiful counter. I could not stay at the store the whole day (as this is a wild week at the office) but I knew Debbie and Jen had everything covered. But I thought about the store the whole time I was gone and the minute it was time for my lunch break, I was off to the store! ...and it was hoppin'! Thank you to everyone for the well wises and the kind comments! These compliments, and seeing you happy, makes all of our hard work worth it! These are a few of the pictures I took over my lunch break. 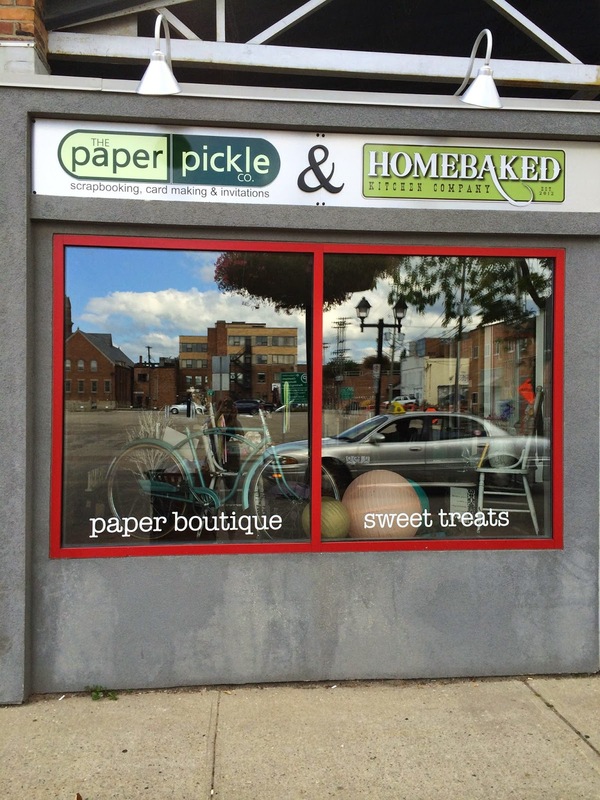 Is Homebaked Kitchen not the perfect partner for The Pickle? If anyone saw me yesterday, they would never know I was running on very little sleep. I was energetic and had this perma-smile. So much so that my cheeks STILL hurt this morning! Now that's a lot of smiling! Ha. The store came together even MORE beautifully than I had imagined. What do you think? I thought I better just remind everyone that we have cut our summer make and takes a little short. With the move, it was just not possible to find time to pull anything together. I hope you understand. We have had great response to the free make and takes and you may see that again in some format again. I should tell you that classes will resume at the end of September. Look for details in future posts! NEW store is now OPEN! 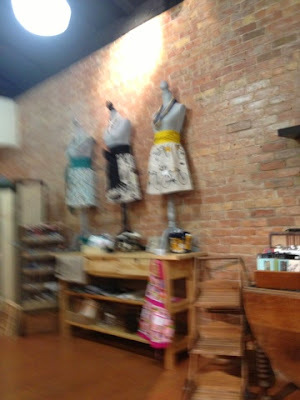 This picture features Jen's gorgeous line of aprons, etc. So last night was crunch time. The last remaining hours to work on the store before the BIG reopening. The kids had to hang out with me since the hubby was out of town. This is something they are accustomed to...they basically have grown up here. 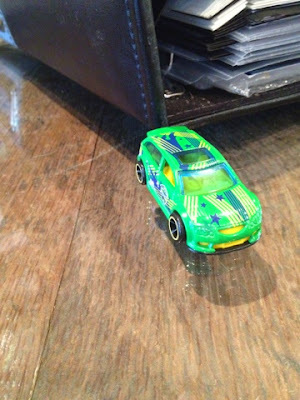 Julia told me that she is happy that The Paper Pickle is back in our old location. I am too! It just feels right. 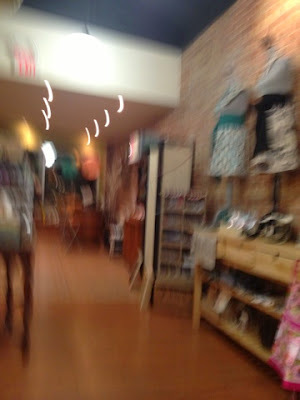 It is only fitting that I give you a glimpse of the store, as photographed by my 6 year old. I kind of wondered how I could give you a little look without giving away to much. Then I found these photos on my phone....I think these photos do the trick. Ha! Clearly his best photo of the night! I had to chuckle because out of the 8+ pictures, the only clear photo was that of his car! Boys. We are open for business! Homebaked Kitchen and The Paper Pickle under ONE roof. This is the life! All I have to say is that while I was typing up Jen's tent cards, I was smiling the entire time. Simply vanilla? Double chocolate pistachio? Apple crumble bars? 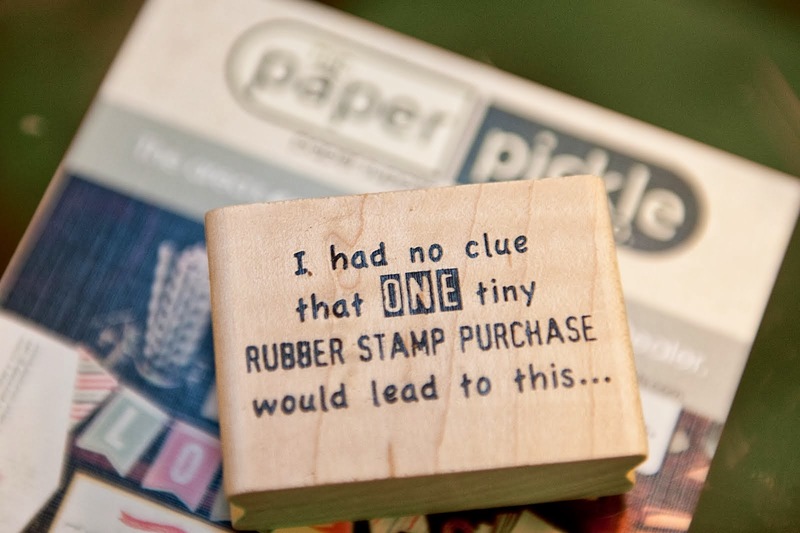 The Paper Pickle will NEVER be the same. ...and sweet treats. Could there be a better combination? What's that saying I use all the time from my favorite movie, Almost Famous? Oh yes..... It's all happening! It is. It really is. Thank you again for all of the kind comments and for your understanding while we remained closed an extra week. I have always believed that extra special people get into (and stay in) this hobby and you have proved my theory correct. We have been working our butts off getting ready for the big opening. Excitement has been building and I just can't take it anymore. We are so thrilled for you to see the place! You can COUNT on our doors opening at 10am tomorrow! 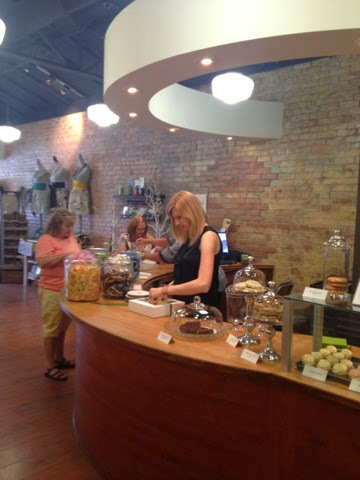 We are going to start with weekly hours of Wednesday-Friday 10am-5:30pm and Saturdays 10am-3pm. Hours (and possibly days) will be added as we determine demand and as we ramp up for various holidays. 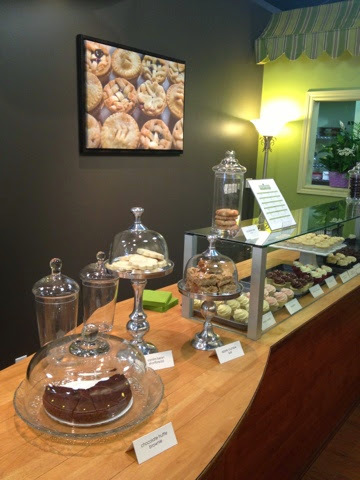 Have a look at our windows above. 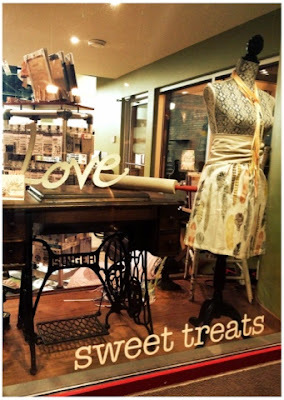 It was so nice working with my sister, Jen to get things just right for our window display. You will notice that she too is very detail oriented and that shows in everything she does from her baking to her product placement. Well, I better keep working away over here. Hope to see you this week! We are both so happy about our new signage! Great job done by Magnum Signs from Chatham. It's funny how you can have every aspect of plan organized, calculated and mapped out, and then life happens. These events can be happy ones or they can be sad, but in any event, plans have to be modified. 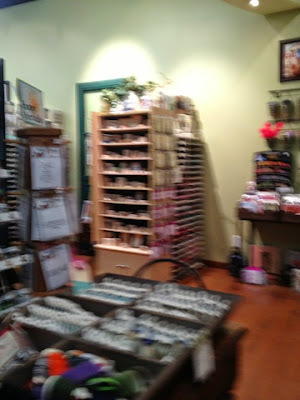 The plan was to re-open today (August 20) in a fresh, "new" store with a brand new partner, Homebaked Kitchen Company. 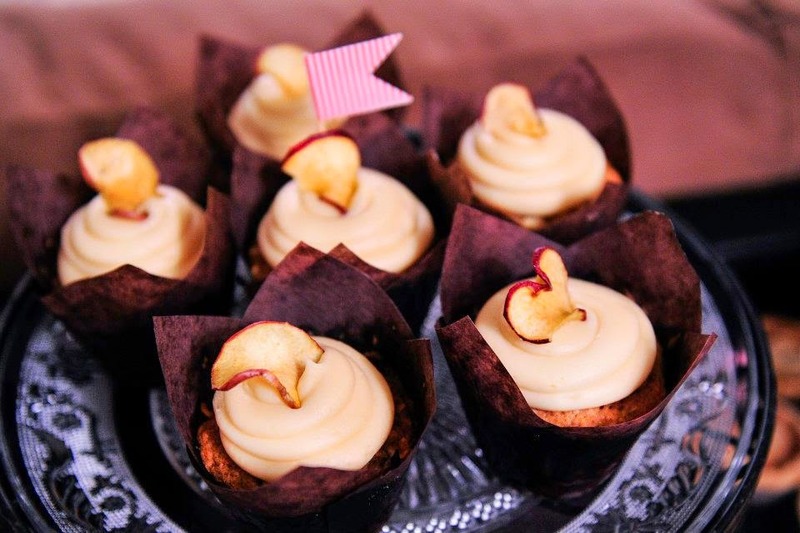 I blogged a week ago about the amazingly talented baker, who just happens to be my youngest sister, Jen. These things have not changed. We are SO excited to team up and show you what we've got. I truly don't think Chatham has ever seen a store quite like ours! A week ago, however, a very sad loss took place. Only because I mentioned this to you publicly a few weeks ago, do I feel the need to talk about this intimately now. This is to help prevent painful and awkward conversations in the future. Jen and her husband lost their baby girl at 28 weeks. They are doing as well as can be expected however a little more time is needed. The Paper Pickle and Homebaked Kitchen Company will take one more week to get ready for our debut and opening. I know you will understand. In the meantime, if you are needing anything, please email me (thepaperpickle@gmail.com) and I would be happy to co-ordinate a time to meet you at the store to accommodate your request. Have you been wondering what the BIG news is?? I thought it was time to let you in on our big news. 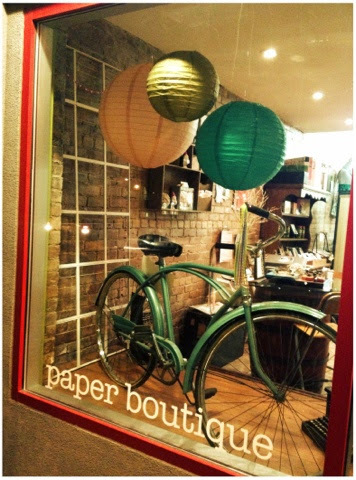 The Paper Pickle Company will be moving BACK to our former location. 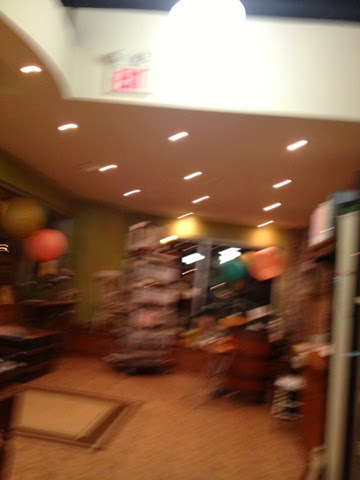 The address is still 44 Fourth Street, Chatham but once again in unit 3 (our dream store). And I couldn't be HAPPIER! Homebaked Kitchen Company will now have a storefront located at 44 Fourth Street (Unit 3). 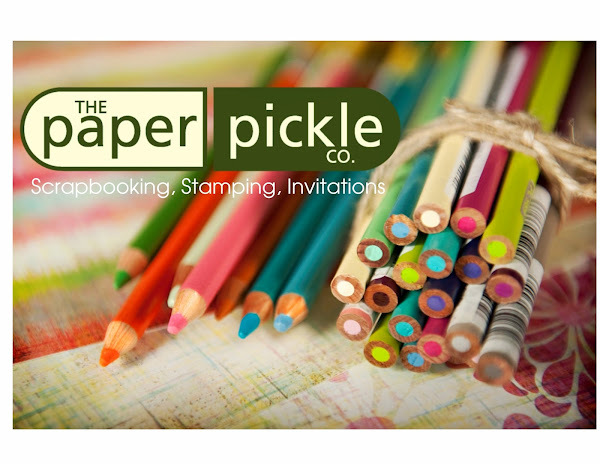 Yes, The Paper Pickle will be teaming up with my sister, Jen's incredible business! Just think, a one stop shop where you can design your dream invites and also get the baked goodies to match! Could life get any better than this?? 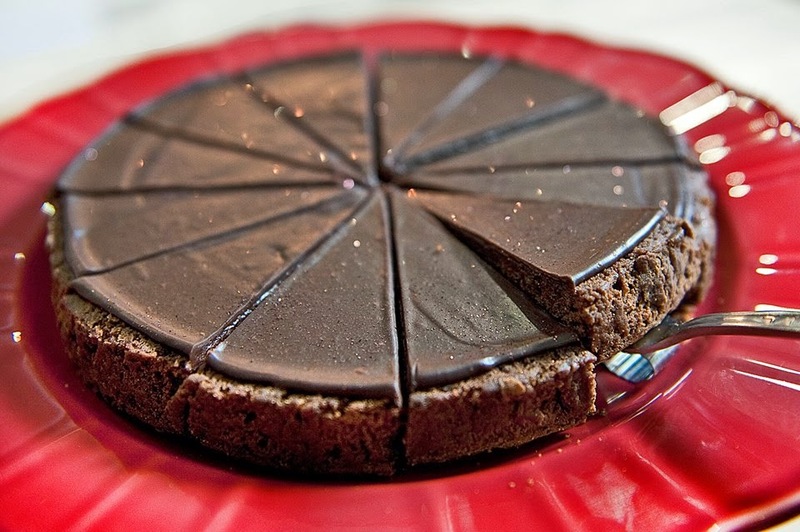 Is your mouth watering? Ha. 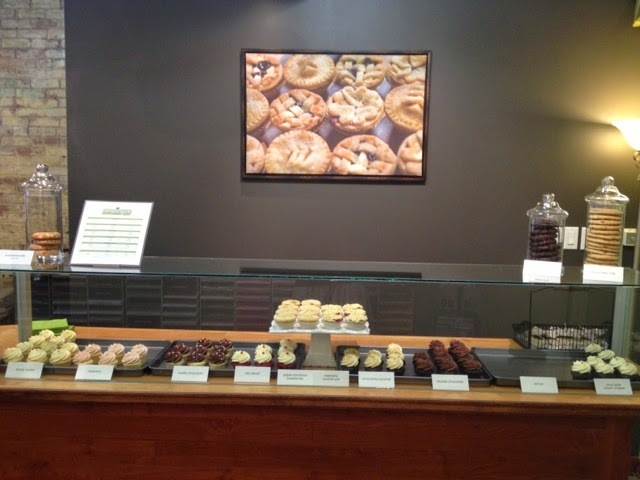 This is just a small sampling of what you can expect in our new shop! Want to see more? Check out Jen's website at www.homebaked.ca. 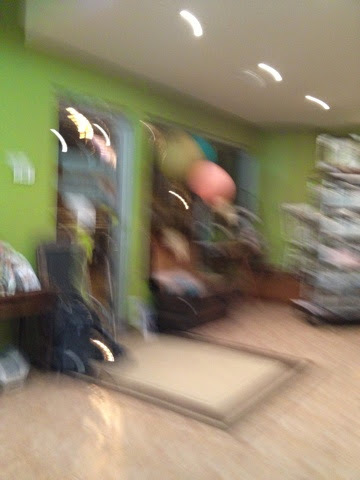 It is going to take a little bit of time to get everything just perfect in the new location. 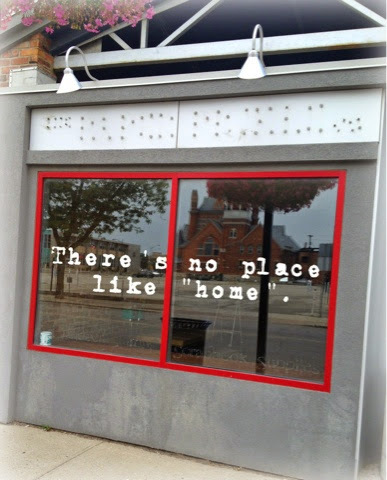 I hope you understand when I tell you we will be closed this entire week to move in properly (August 11-16). The new store is set to open AUGUST 20th at 10am! We will also need a little time to transition in the the new space. We will be open August 20, 21, 22 and then CLOSED on August 23. I know I have not given you much notice about this. So I will be available to meet you should you have any paper emergencies. Please email me at thepaperpickle@gmail.com and let me know how I can help. Truly, I will be around so it is no trouble at all (just make sure to give me a little heads up and I will do my best to make it happen). Anyways, I am so THRILLED to finally be able to share this news with you! I hope you are as excited as I am. Can you imagine what out Christmas Open House is going to be like this year? Crazy. Today is THE day to visit The Pickle! A HUGE shipment of Memory Box dies have arrived. Have a look and see if we got in your favorite new release. The infamous "tilth floral" is BACK! If you have been waiting a while, today is finally the day! We also have our FREE make and take going on from 10-5 today!! Today's tag was inspired by all the amazing veggie stands that I cannot get enough of this time of year! Try our marker spritzer gun, stencils and more! 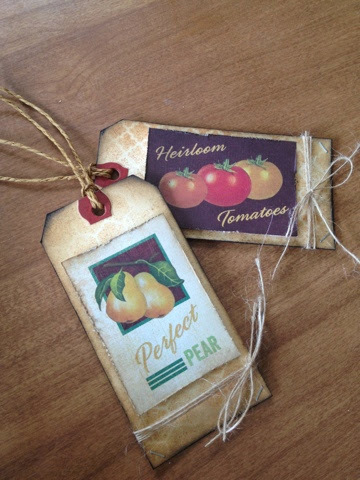 Look how easy it is to make gorgeous tags using Basic Grey's paper and these techniques. Creating CAN be simple, yet effective! Hey, superstar. Get in here! So we decided to take a couple of extra days off and we took the kids to Erieau/Erie Beach for a little vacation. We really are so lucky to have this beautiful lake pretty much in our backyard. Far enough away to relax and get away from the day to day grind but close enough to still be able to come in for soccer games and to feed the cats. We have had some gorgeous weather and have enjoyed the beach. We had a rain day yesterday and it was amazing. Nothing to do outside, so we kept the fun going inside! This is a project I've been wanting to work on for sometime. 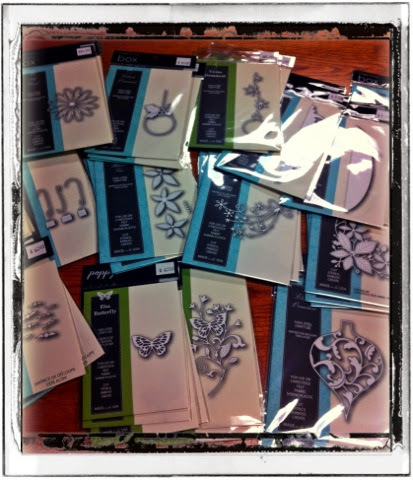 These little hangers from Melissa Francis are perfect for a scrap booking on the wall project (in store now for $6.50). 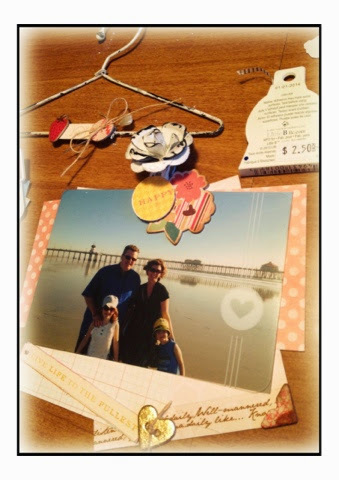 I love to have my scrap booking out for all to see and these hangers are perfect. 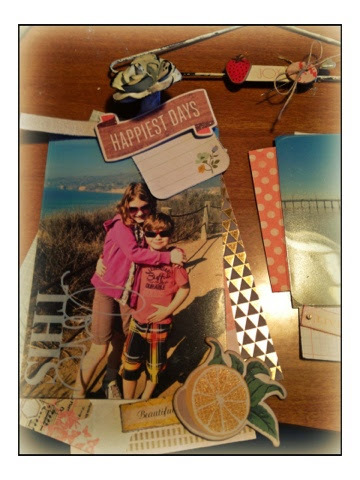 You could even scrapbook your traditional 12x12 layout and then clip it up and rotate as you create new favorites. My project was more of a collage style layout working with bits and pieces patterned papers that I brought out to the cottage. 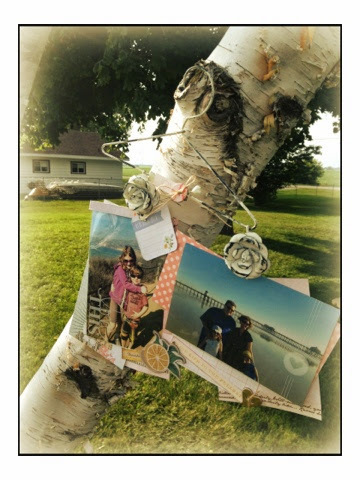 Embellishments included Washi tape, chipboard pieces, overlays from project life etc. This project makes me so happy! I'll bring it into the store Saturday for a little show and tell! PS...I hope this post comes across ok. It was all done on my phone and I know sometimes pictures get formatted funny.